Built by early 20th-century American architect Lilian Rice, this private estate beautifully illustrates the classic California Spanish colonial style the famous eco-conscious architect was known for. 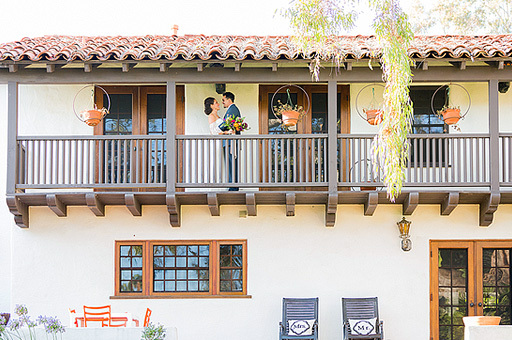 Both charming and grand, the property boasts intricate hand-painted Spanish tiles, exposed wood beams, classic arcades and a flat white stucco exterior, all staples of the classic Rancho Santa Fe Spanish aesthetic. Archways covered in crawling vines, a towering Spanish-style chimney, hundreds of mature citrus trees and an impeccably designed outdoor living area make for the perfect Spanish oasis for your next soiree. Light the wood-burning fireplace, drape the striking wood beams in understated bistro lights and adorn the pool with simple floating candles to add unparalleled romance to your nighttime nuptials. Or, for a daytime affair, let the scent of citrus and the clear Rancho Santa Fe air awaken your guests as they step into a world that will take them back to the aesthetic found only in California in the 1920s. The 3.09-acre property can accommodate up to 200 guests for your event and rental includes access to two restrooms and the property’s casita, complete with a bridal changing suite.